Motamec Racing is a British manufacturer of automobile tools and equipment, based in North Wales in Gwynedd. 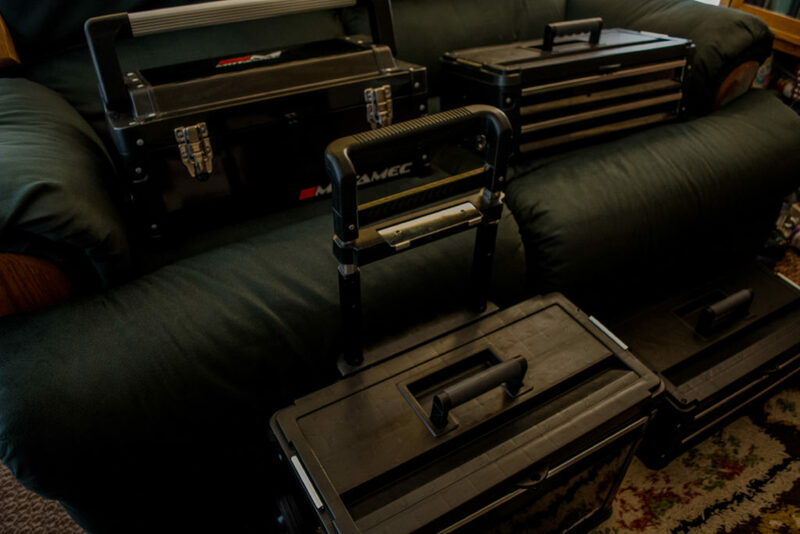 The Motamec Racing Modular Tool Cart consists of four modular toolboxes. I’ve been through a lot of toolboxes over the years, but I think I’ve finally found one that ticks all the boxes for me. 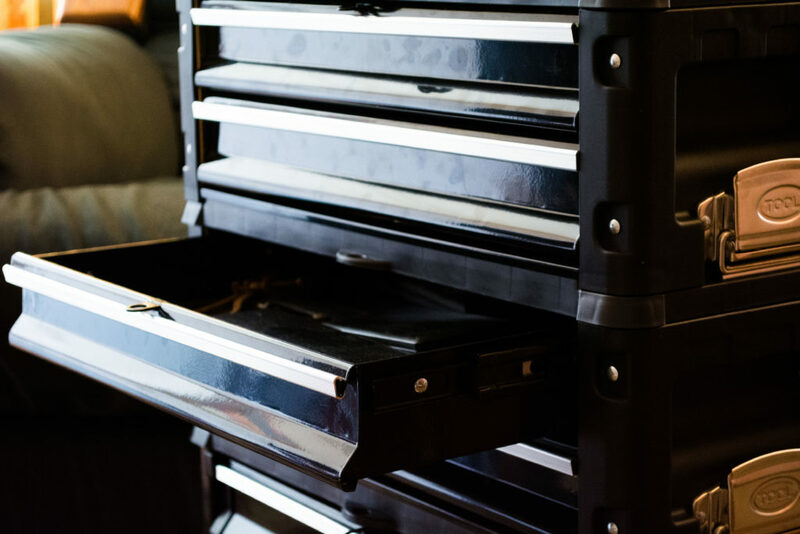 Though the Modular Tool Cart is primarily geared towards track teams, there’s no reason why you couldn’t also use it as a toolbox in other professions. The problem most chest style toolboxes suffer from is that they’re almost impossible to move once they’re fully loaded with your toolkit, even with wheels, and there’s always the issue that you don’t always need all your tools with you. The Modular Tool Cart splits into four separate toolboxes, separating and attaching them is as simple as pulling the side catches, though they are designed smartly, meaning they won’t come apart during transit. The Modular Tool Cart is far more than just bolted together steel sheets; I’m blown away by how much attention to detail there is with the overall shape and design of each module, the shapes used, and construction which offers an aesthetically pleasing and fantastic amount of structural rigidity. The shapes also mean that when stacking the toolboxes, they are guided into place on top of each other, almost like LEGO bricks, with the top of the module below fitting into the reciprocating base of the one above it. Portability seems to be the objective at hand with the Modular Tool Cart, and Motamec Racing succeed wholeheartedly with that. The Modular Tool Cart has an assembled size of 50cm x 30cm x 88.9cm. Not the biggest, but by no means the smallest, you’re able to pack a considerable number of tools into a vertical space, whilst keeping a lean depth; perfect for the toolbox having an unobtrusive footprint in your workshop, vehicle, or generally in your home when it’s not in use. This lean footprint is also surprisingly vertically sound; you’re not going to knock it over by accident. The Modular Tool Cart is available in several different colours and graphical designs, which mimic the liveries of famous track cars and bikes, but they are all the same brilliant product under the paintwork. This Modular Tool Cart is predominantly a professional-looking piano black, featuring the stylish Motamec logo in red and white in various places across its understated, tastefully minimalist design. There’s a really nice design choice made; the drawer handles are silver, so they’re easy to open at a glance. The Modular Tool Cart toolbox has received many compliments since I started using it, and plenty of people have been asking me where to get one of their own. When assembled as a trolley, the Modular Tool Cart weighs 20kg without tools; not bad considering the capacity. The Modular Tool Cart is constructed from heavy duty steel, though even when loaded up, the toolboxes never feel cumbersome to carry. That’s partly thanks to the brilliant handle designs on each section. The rear handle allows you to easily move the Modular Tool Cart. You can extend the rear handle by pressing a button on it and pulling upwards. I extended it to an appropriate height for me, something I wasn’t expecting as I’m 6’3”. There is a tabbed metal plate that moves with the extendible handle. This locks into the drawer module and keeps everything in place, even after you pull the side catches, meaning that removing a module requires pressing the handle’s button to move it and then intentionally remove it. This is a practical safety feature to avoid dropping any of the drawers onto your toes whilst removing the top module. The handles on the middle sections fold into the centre of each toolbox module, and feature an ergonomic rubberized underside to the handle, with indentations for your fingers. There is a nice alloy handle on the top toolbox module that folds down flush with the top surface of the upper module’s lid. 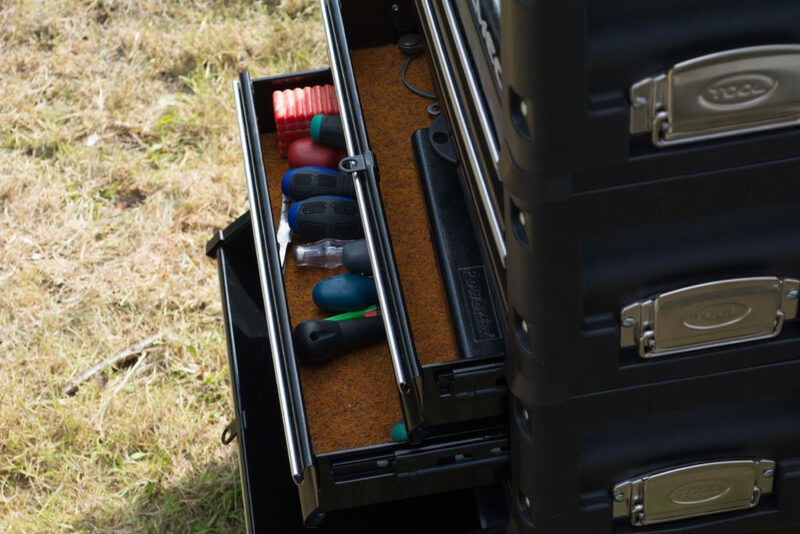 The top toolbox also features a removable tote tray with lots of useful sections. There are two high quality polypropylene rear wheels. They’re decently sized too, unlike most toolbox wheels, which are usually comically insubstantial. The wheels are so sturdy that I don’t mind taking my tools through pedestrianized areas now, which was previously an inconvenience, but now I can handle slopes and steps with ease. The entire underside of the tool cart is rugged black plastic, so there’s no need to worry about scuffing the paintwork on steps and stones. There are two drawer modules, each internally 43cm x 22cm x 15cm in size. The drawers have a very smooth sliding action, thanks to the steel ball bearing slides, and they lock into place when pushed firmly into the toolbox, an action that feels very reassuring. There is a larger, lower storage compartment with swing door, internally measuring 40cm x 21cm x 24cm, and it is ideal for bulkier tools such as impact wrenches and drills, as well as additional batteries for them. The Modular Tool Cart features loops for adding padlocks to the toolbox if you ever need to leave it unattended. Drawer liners aren’t provided with the toolbox, but it was solved in ten minutes by cutting my own to fit, as I usually do. Installing drawer liners means that I’m not forced to listen to tools rattling around whilst driving, or risk damaging any of the contents as they’re firmly sat in place during transit. Everything is where I left it when it comes to opening the toolbox; no rummaging around. These little touches make all the difference with the Modular Tool Cart, including the rubber feet on each level to make sure that it doesn’t scratch or scuff the area beneath it. My only real criticism of the toolbox is the rubber feet of the upper toolbox, which on occasion come loose and require pushing back into place (a second of work), though it’s nothing that a little glue didn’t fix permanently for me. The corners are reinforced with thick industrial grade plastic, meaning that unlike a lot of other toolboxes, you won’t get warping and distortion of the chassis when you lift it. These toolboxes are solid! In terms of durability, the Modular Tool Cart is a toolbox that’s probably going to outlast your tools! This is a toolbox that’s going to give you many years of service. Motamec Racing have addressed a lot of problems with toolboxes in general, and are offering a really great product, for me at least. Toolboxes are a very personal thing– what’s right for me might be wrong for you, but as a toolbox of this concept, it’s definitely up there. For £179 including the VAT, you really can’t go wrong with the Modular Tool Cart. It’s great for when you need to be able to cart your tools around with you easily, and take specific toolboxes with you in a quick and easy manner when you don’t need all your tools for a job. You would be hard pushed to find anything comparable in this price range that isn’t flimsy, bulky, or generally inconvenient. The Motamec Racing Modular Tool Cart is something that I can confidently recommend to anybody who uses tools professionally on a day-to-day basis. You can buy a Modular Tool Cart of your own from the Motamec Racing website. Just How Far Is Marketing Technology Going?